Our brand new Easy Clip Heavy Duty Shelving 1000mm wide is manufactured with weight in mind. Each shelf has a maximum weight load of 400kg, making it suitable for storage, stock rooms and warehouses, as well as shop floors. It has a rustic industrial design and simply clicks together. The shelves are then easily dropped into position. An additional advantage of these shelves is the ability to join individual shelving units together to create a run of warehouse shelving. 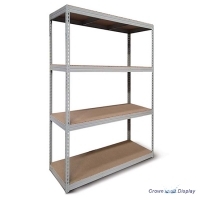 This, combined with 3 different available heights, means you can create the retail shop shelving storage that suits you.